Chris Johanson, “Untitled”, 2018. Image courtesy of Altman Siegel. September 6 to October 27– Chris Johanson: Ruminations, Meditations, and The Homeostasis at Altman Siegel: Johanson creates thoughtful and vibrant reflections of everyday life and the human condition. A central figure of San Francisco’s Mission School, Johanson’s multidimensional practice encompasses painting, drawing, sculpture, installation and music. For this exhibition, he traverses years of his art-making life, accumulating many different influences to illuminate life’s complexities. The resulting works touch on universal themes including spirituality, sociology and environmental observation. Unlike his previous work, Johanson will show stretched-canvas paintings, originated from studio drop cloths. The portable nature of the material aligns with his subject matter; human faces, animals, interiors and landscapes appear in motion across the paintings’ organic surfaces. Johanson’s paintings position themselves as conceptually open–fluid to interpretations and inviting conversation. Altman Siegel is located at 1150 25th Street. Opening Reception: Thursday, September 6, 6– 8pm. Captain J Rab will play a live music set at the opening and an unlimited edition poster, designed in collaboration with Colpa Press, will be available at the gallery. Image from the last event. Image courtesy of Yerba Buena Center for the Arts. 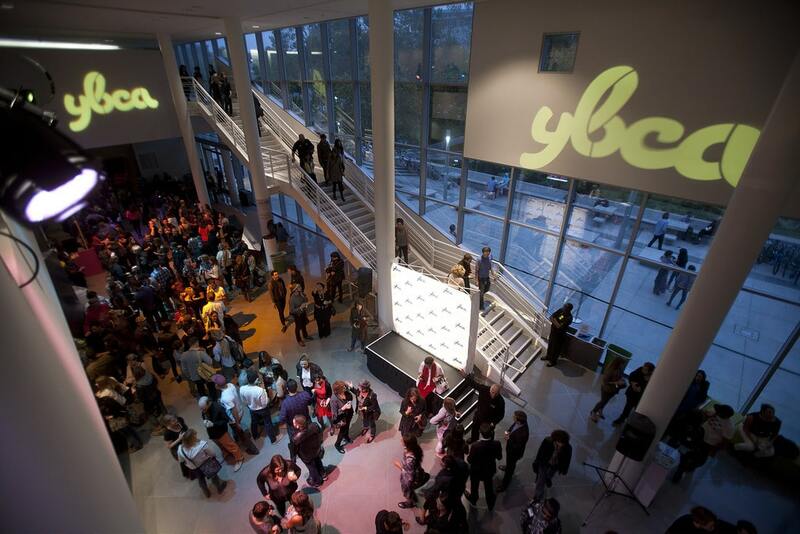 Friday, September 7, 7pm– BAY AREA NOW 8 Opening Night Party at Yerba Buena Center for the Arts (YBCA): The opening of BAY AREA NOW 8, YBCA’s signature triennial exhibition is a celebration and opportunity to meet the artists who created the work. The exhibition showcases 25 local artists, architects, and designers in a broad range of creative practices, including painting, photography, ceramics, textiles, video installation, and digital media. For the first time in its history, the exhibition will also include architects and designers working at the leading edge of environmental, landscape, and housing design. YBCA is located at 701 Mission Street. (left) Joe Ferriso, “Forty- Nine Un- Wildflowers: The California Poppy”, 2018. (right) Bonanza, “Change Clothes and Go”, 2017. Images courtesy of Gallery 16. 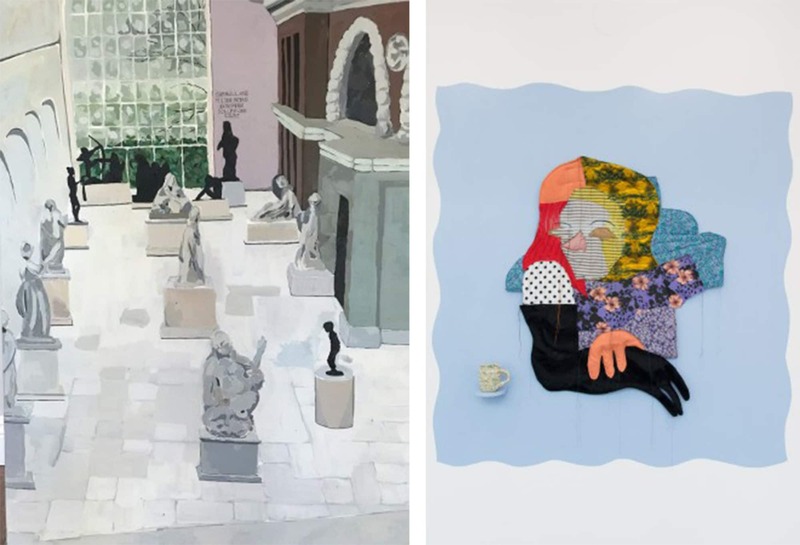 September 7 to October 26– Joe Ferriso: Cutaway and Bonanza: Arrangements at Gallery 16: Joe Ferriso is a recent graduate of the MFA painting program at Stanford University. Ferriso is fascinated with developing two-dimensional paintings that can be expanded into three-dimensional forms. Similar to the actual California poppy that closes each night and on cloudy days, these fabricated flowers open and close from two-dimensional to three-dimensional. Even in Ferriso’s more traditional paintings on panel, the artist seeks to create a three-dimensional experience through his palette. Using a paint roller to create these abstract paintings rather than a brush, the textural randomness removes the artist’s hand. In this flattened field, Ferriso’s color correlations produce a visual effect—one of hovering, vibrating spaces over layered fields of color. Bonanza is the collaborative practice of Conrad Guevara, Lindsay Tully, and Lana Williams, whom all just concluded their residency at Recology. Their work draws upon the artists’ respective experiences as a filmmaker, sculptor, and painter and centers around issues of identity and authorship. Similar to musical and floral compositions, Bonanza arranges their paintings and sculptures with special emphasis on balance, contrast, variation and harmony. Each composition is a constellation of elements and marks, the results of three subjectivities merging as one. Their individual pieces perform together creating rhythms and transitions highlighted by material sensibilities, color interactions and placement. Gallery 16 is located at 501 Third Street. 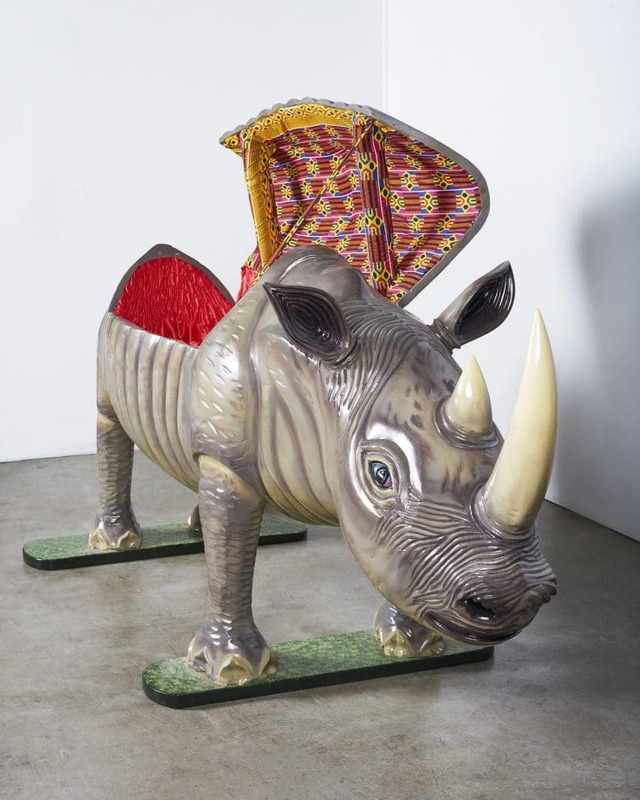 Paa Joe, “Rhino,” 2016. Image courtesy of Ever Gold [Projects]. September 8 to October 27 – Defying the Narrative: Contemporary Art from West and Southern Africa at (Ever Gold Projects): This group exhibition consists of 15 African artists working in a wide variety of media from diverse backgrounds. Collectively, their work defies the reductive Western conception of Africa as a monoculture and of African artists as working in isolation without access to art history and technology. By resisting this impulse to apply familiar or conventional understandings of contemporary and historical African art, it gives the viewer an opportunity to experience this work in a more dynamic and holistic way. While all of the artists in the exhibition are African, they represent a broad spectrum of perspectives, ideologies, and geographic origins, and the lack of a unifying narrative among them in both the premise and the conceit of this exhibition. Ever Gold (Projects) is located at 1275 Minnesota Street, Suite 105. Adam Linder, “Choreographic Service No.1: Some Cleaning,” 2013, pictured at Kunstverein Hannover. Image courtesy of The Wattis Institute. 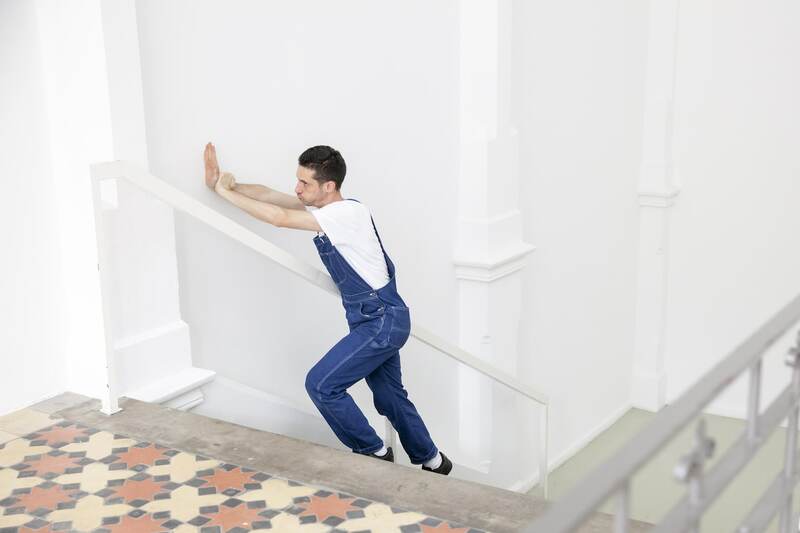 September 8 to 29– Adam Linder: Full Service at The Wattis Institute: Australian artist, Adam Linder’s singular approach to dance and performance is described as “Services”. Live performances will take place every day from 12- 6pm during the course of the exhibition. Each performance is presented over the course of three weeks, across two galleries. Each “Service” is also performed successively, but they also overlap and re–appear in different combinations, creating new hybrids and juxtapositions of bodies and movements. In the crafting of carefully arranged dance performances, Linder acts as the choreographic equivalent of a film editor, creating an assemblage of occasions, phrases, postures, and poses. Varied in its approach to style and form, Linder’s work offers insight into a new way of measuring time through live performance. The Wattis Institute is located at 360 Kansas Street. Opening Reception and Performances: Saturday, September 8, 6:30– 8:30pm. Noam Rappaport, “Untitled”, 2018. Image courtesy of Ratio 3. 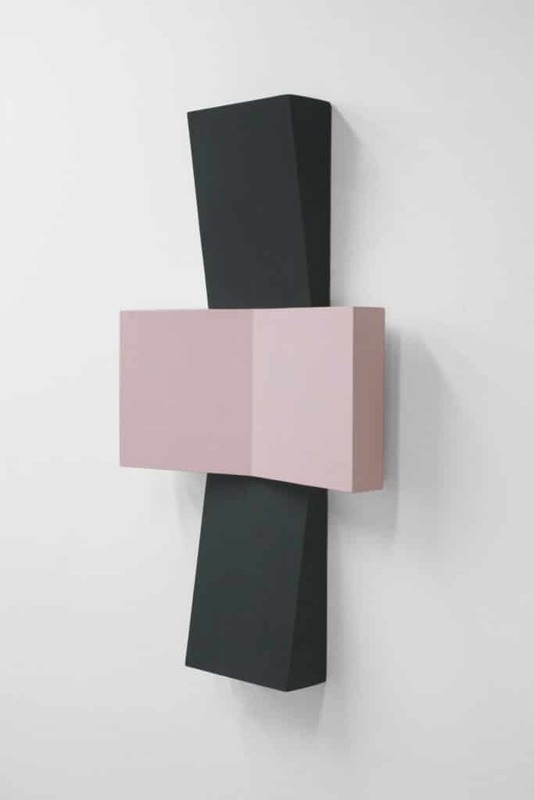 September 12 to October 27– Noam Rappaport at Ratio 3: Rappaport’s new sculptural wall- relief works have an uncanny resemblance to domestic objects and architectural fixtures like light switches and shelving brackets. Their layered forms, subtle color shifts, and curved surfaces interact with their surrounding architecture in subtle, unexpected ways. Teetering between painting and sculpture, Rappaport’s hybrid open- form objects take on a character of their own. Through the use of commonplace materials, such as stretcher bars, nails, screws, and wiring, Rappaport’s art approaches formalism through a decidedly informal process. Ratio 3 is located at 2831A Mission Street. Cybele Lyle, installation view. Image courtesy of Et al. etc. September 12 to October 27– Cybele Lyle: The Desert in Four Parts: Part 1: Between What Came Before at Et al. etc. 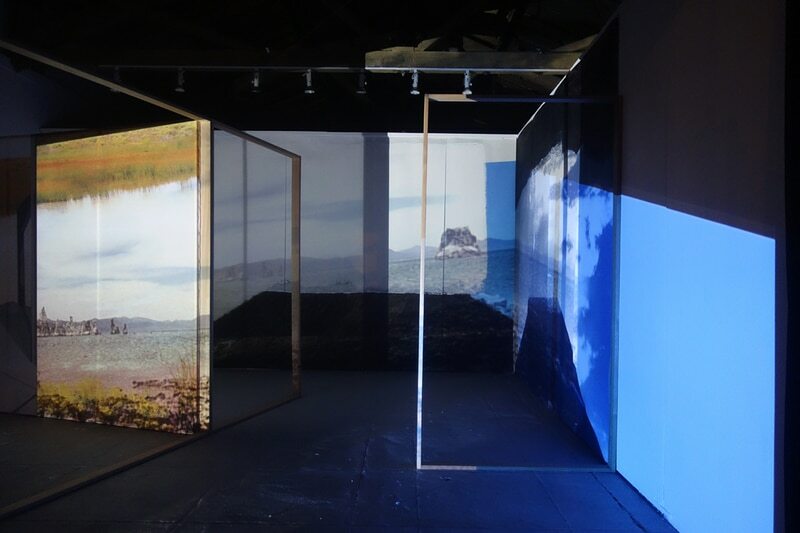 : Cybele Lyle’s installation, video and 2D work reconstructs the architecture and natural environment around her into an alternate vision of interior and exterior space. 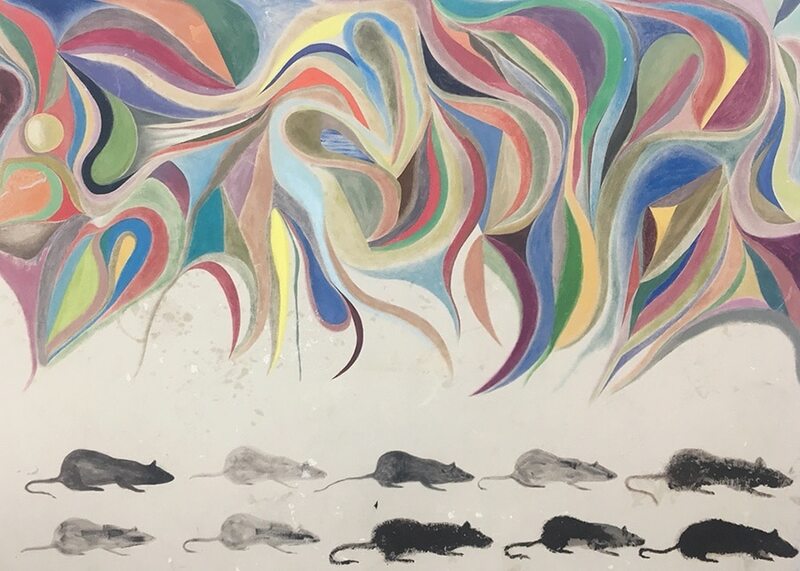 For this exhibition, Lyle has created a group of large-scale paintings that will be shown in a sculptural installation. Using various strategies of documentation, Lyle’s work examines issues of identity and social representation by focusing the lens on both herself and her community. Since recently moving to Los Angeles, Lyle has been inspired by the fashion district downtown. She uses social and visual material of her own life to represent spaces of transformative potential and desire. Et al. etc. is located at 2831 Mission Street. Etel Adnan, “Untitled”, 2018. Image courtesy of the San Francisco Museum of Modern Art. 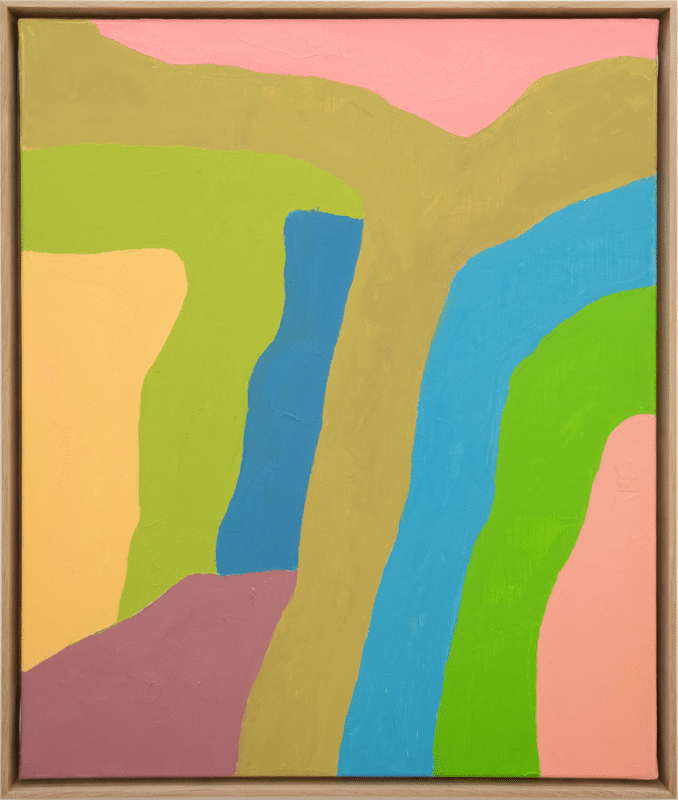 September 1 to January 6– Etel Adnan: New Work at the San Francisco Museum of Modern Art (SFMOMA): 93 year old visual artist, poet, and essayist Etel Adnan writes what must be communicated through language, and paints what cannot. While her earliest paintings lived in the realm of pure abstraction, she is best known for her landscape works inspired by her long obsession with Mount Tamalpais. Adnan’s recent works return to abstraction, most specifically, color and its possibilities. SFMOMA is located at 151 Third Street. Related Event: Thursday, September 20, 7- 9pm– A Ballad for Etel Adnan: The event will be an exploration of Etel Adnan’s relationship to Bay Area creative communities with a night of poetry and musical performances. Artist Simone Fattal and poets David Buuck, Nick Hoff, and Denise Newman share selections from both Adnan’s writing and their own. The evening’s festivities continue with a performance by experimental harpist and composer Zeena Parkins and percussionist William Winant inspired by Adnan’s long relationship to color, abstraction, and the California landscape. Image from last years event. Image courtesy of SF Camerawork. September 22, 5pm– SF Camerawork 2018 Benefit Auction at SF Camerawork: The Benefit Auction is SF Camerawork’s most important annual fundraiser, and the proceeds directly support their mission to support emerging artists exploring new directions and ideas in the photographic arts. 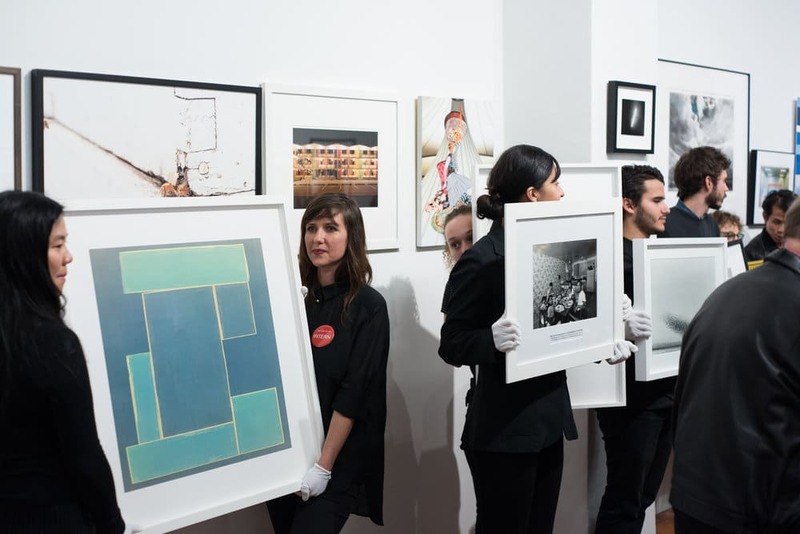 The traditional live auction is a favorite among serious photography collectors nationwide and will feature exceptional, highly curated lots representing a range of work by both emerging and internationally distinguished artists. SF Camerawork is located at 1011 Market Street, 2nd Floor. Featured artworks will be on display prior to the auction from Saturday, September 8 through Friday, September 21 from 12– 6pm and by appointment at SF Camerawork. The auction preview exhibition is free and open to the public. (left) Hilary Pecis, “Untitled”, 2018. (right) Maria Guzman Capron, “Untitled”, 2018. Images courtesy of Guerrero Gallery. September 22 to October 13– Hilary Pecis and Maria Guzman Capron at Guerrero Gallery: Using her surroundings as inspiration, Hilary Pecis’ work is based off of a photograph sourced from her personal collection of images, which she takes on a regular basis. Each work uniquely reflects the light, aesthetics, and pace of Los Angeles and offers an intimate glimpse into her daily life. The process of translating these photographs into paintings allows Pecis the opportunity to meditate on the specific moment and memory captured. Maria Guzman Capron makes large, quilted sculptures pieced together from loud fabrics found at discount stores. They vaguely mimic figures and body parts, but only of the oddly amorphous sort. Capron likes that quilted fabrics remind her of the suppleness of the human body, and that she can manipulate them to also evoke muscularity — exploring the ambiguous relationship between gender and bodily forms. Guerrero Gallery is located at 1465 Custer Avenue. Zak Ove, “Invisible Man and the Masque of Blackness”, installation view, 2018. Image courtesy of The San Francisco Arts Commission. Ongoing to early November– Zak Ove: The Invisible Man And The Masque Of Blackness Installation at Civic Center Plaza: Invisible Man and the Masque of Blackness is a monumental installation of 40 identical figurative sculptures created by British- Trinidadian artist, Zak Ove. The work speaks to contemporary issues of race, politics and identity. 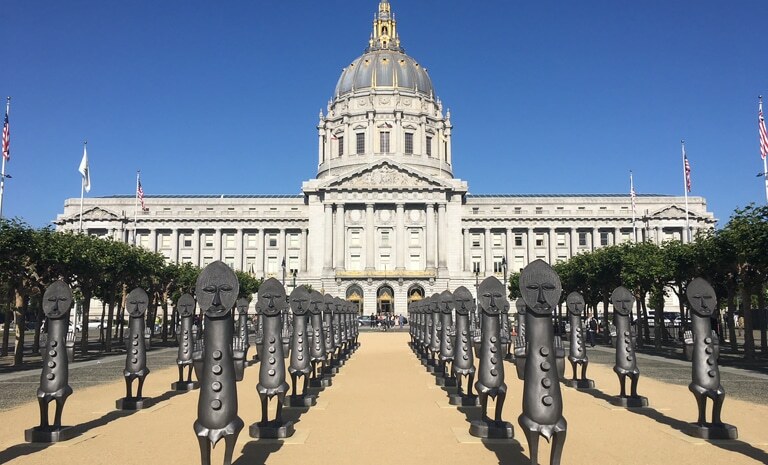 The sculptures are arranged in four rows of ten facing San Francisco City Hall. The figures are all six and a half feet tall and 300 pounds that stand upright with their “hands up” in a precise formation that aligns with the symmetry of the surrounding architecture. Each piece is sculpted to resemble a Kenyan statuette that Zak Ove has had since childhood and which has served as a muse for him during his career. Civic Center Plaza is located at 335 McAllister Street.